I’ll explain the posting situation a bit first. After I got my blackberry I found that I had to switch service provider in order to use the internet and subsequently post. What I am doing now is borrowing Bjoerns computer to post while importing photos from my phone. By Tuesday the service provider problem should be fixed and posting will go a bit easier and with more regularity. A reindeer skin is now tanned to completion (the one on the wringing photo) and tomorrow I’ll have a go at scraping one of the moose skins in the stack here. Moose skin has great strenght, but also requires quite a bit of physical strength in order to scrape it, especially in the neck area on bulls, the grain can sit really stubbornly. I usually don’t buck the skins, but when I have that seems to ease the situation quite a bit. The reason why I don’t do it is some bad experiences with burning the skins with too strong ashes. Exploring the valley as well as making ends meet foodwise is what I am doing with my days. There is quite a rich plant diversity here, with some heat loving species I am not so used to, such as yew. 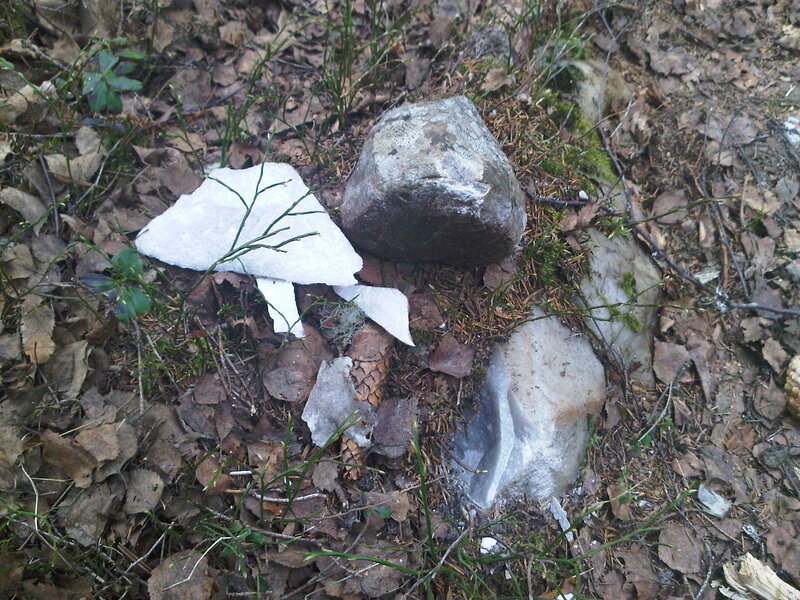 The stone type that dominates the area is quartzite. Been testing it for tool quality and I find it to be usable, but a bit coarse in general. There is luckily not much snow left and the hares, deer and moose are seeking out the fields and clearings to snack on the sprouting vegetation. Spring is my favourite time to tan skins. Weather is usually pretty stable and it is warm enough, yet not so warm as to dry out the skin too quickly. Buckskin production described very simply is: Taking a soaked hide (already fleshed), scraping the hairs and grain off. Then a solution of brains, eggs or similar fatty substances are being worked into it. After that you wring it and start manipulating it as it dries. When dry, it can be smoked or just used as is. I recommend Matt Richards’ “Deerskins into Buckskins” for more details on braintanning. 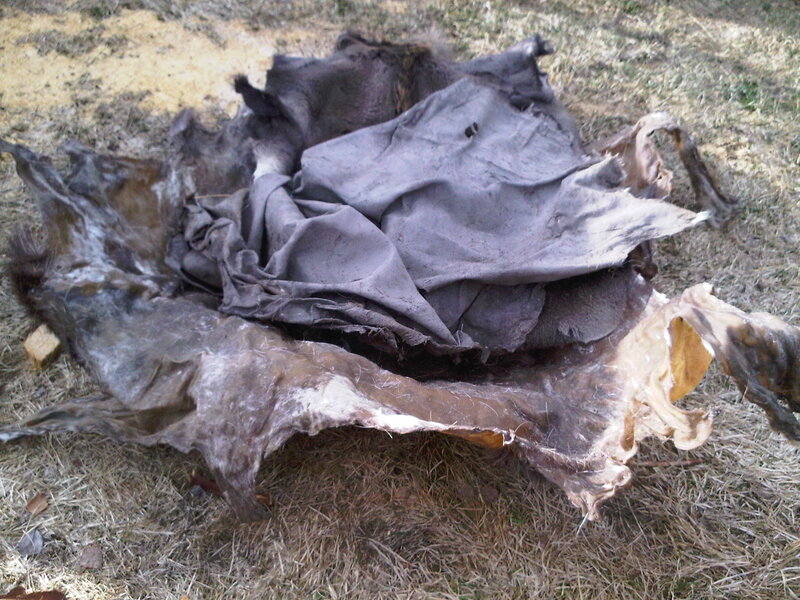 The following picture is of a dehaired reindeer hide being wrung before softening. Yesterday I didn’t manage to update because of connection issues. 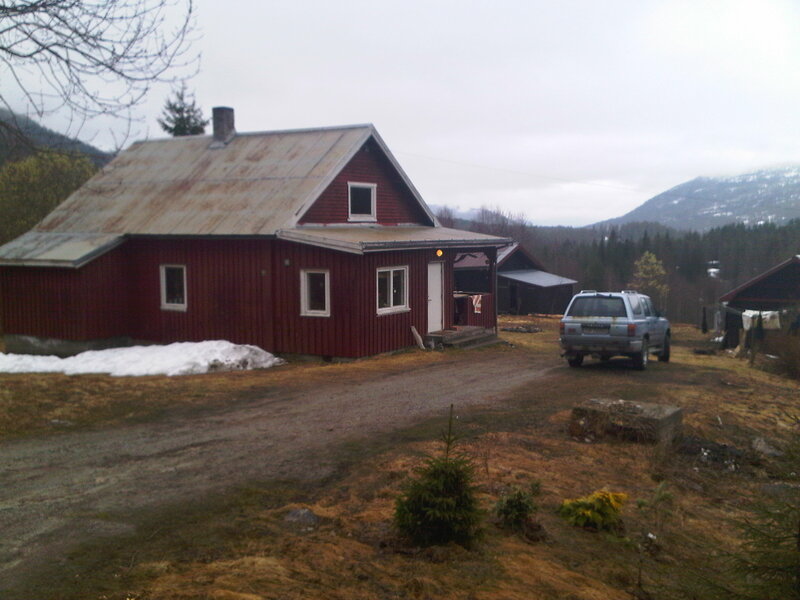 I took a ride with Bjoern to the eco-village of Kaffihaugen, a newly forming eco-village further to the east. Chances are high that I’ll make it my “base of operations” in the near future. For now I am staying there until other plans arise. I’ll make a lean-to soon and over the nearest future, tan some skins and fish in the river as well as exploring the general area. Today I have had a visitor. 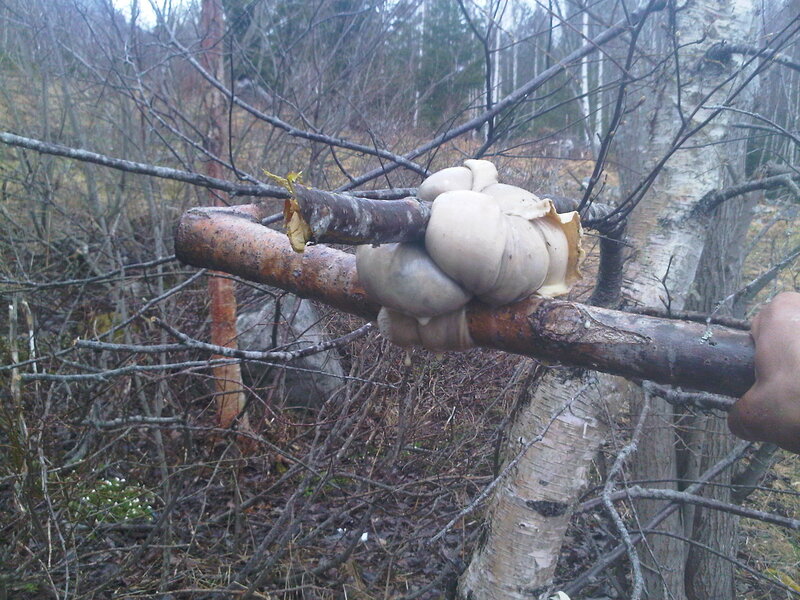 Bjørn (in the pic) and I have moved plums, cherries and blackcurrants to my forest garden. I will expand the variety of plants as they become available. A forest garden is a low maintainance system mimicing the natural processes and structures of a forest. 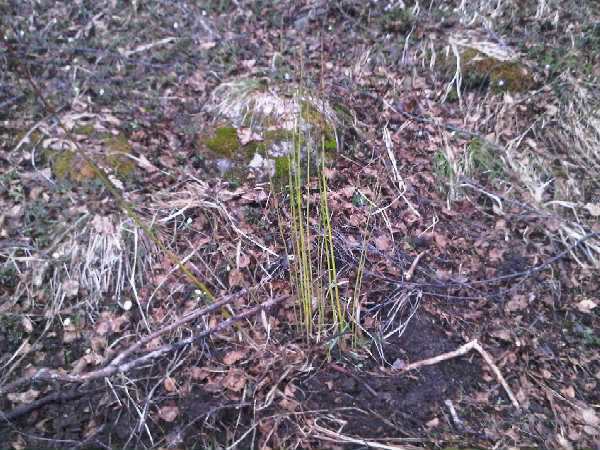 It can be established from scratch or by modifying a piece of existing forest. 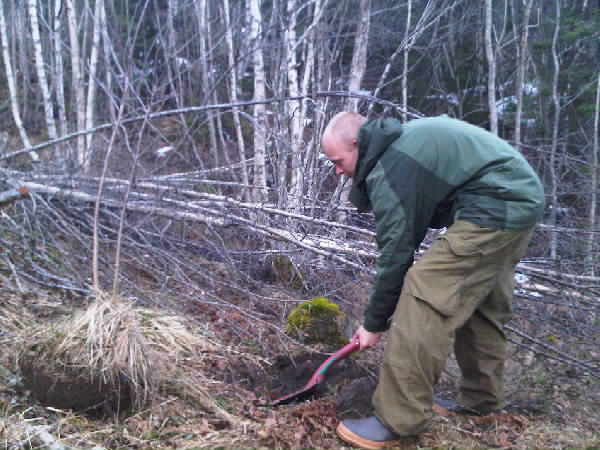 In this particular one I have cleared birch to make room for the food producing plants.